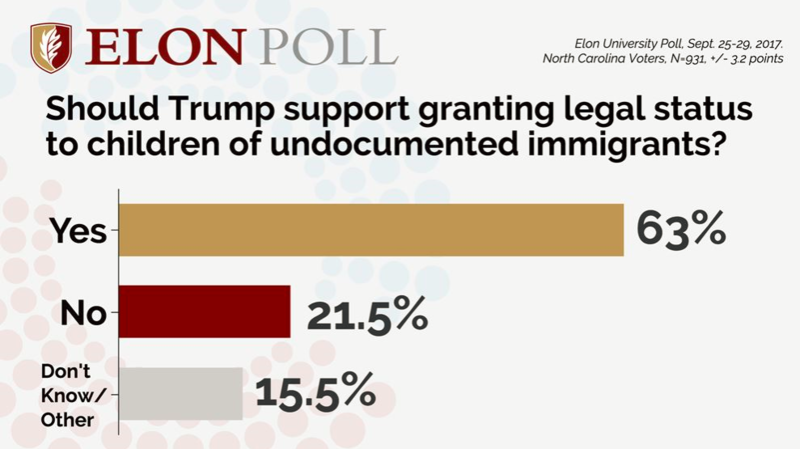 The new Elon University Poll results are out and they give an interesting snapshot of North Carolina’s opinions on a range of controversial issues. 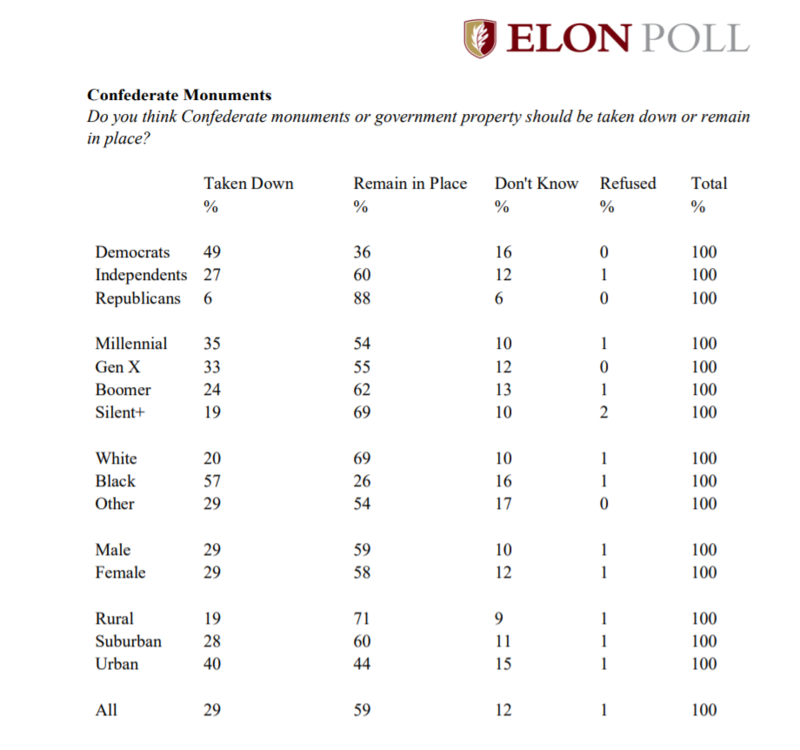 On the ongoing controversy over the removal of Confederate monuments from state property, the poll found a majority of those polled – 59 percent – would prefer to see them stay in place. 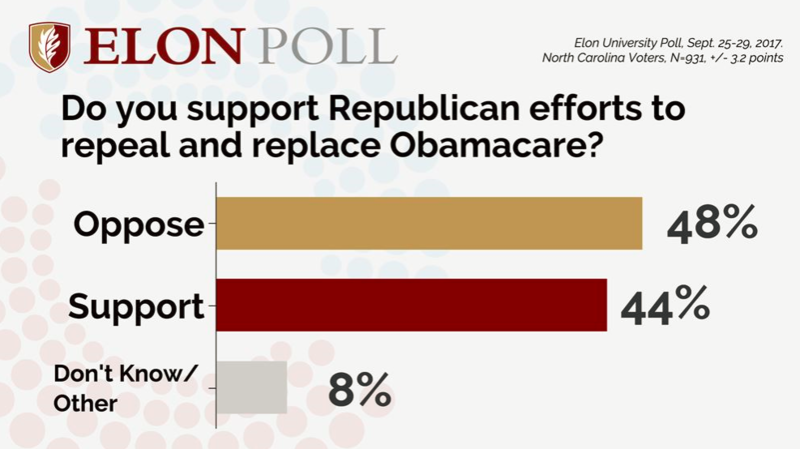 There are clear party and demographic divisions in North Carolina on the issue. Among Republicans, 88 percent believe the monuments should remain in place, compared to 36 percent of Democrats. Younger voters are less likely to say they should remain in place, but even among the youngest, Millennials, 54 percent say the monuments should stay. More than a quarter of black voters — 26 percent — say the monuments should remain compared to 69 percent of white voters who hold that view. Rural voters are significantly more likely to advocate for the monuments to remain, with 71 percent holding that view compared to 44 percent of urban voters. Men and women were split on the issue by roughly the same margins. On the question of whether President Donald Trump should support the granting of legal status to children of undocumented immigrants, 63 percent supported legal status with just 21.5 percent opposing it. A little over fifteen percent said they did not know. Respondents were more more closely split on Republican efforts to repeal and replace Obamacare with 48 percent opposing the effort, 44 percent supporting it and 8 percent saying they don’t know. 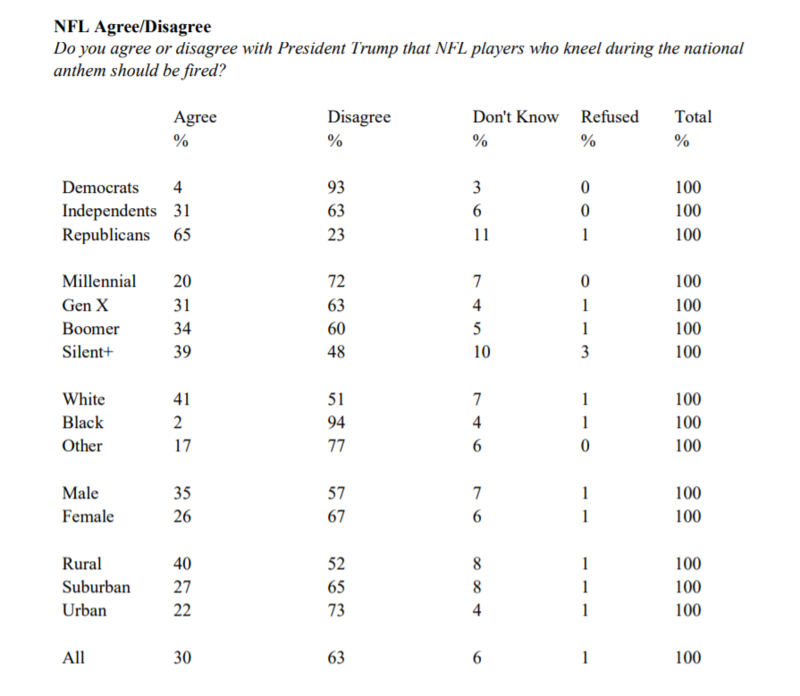 Respondents were clearer on their views of the president’s assertion that NFL players should lose their jobs for protesting racially biased policing and police violence by kneeling during the national anthem. Sixty-three percent of respondents said they disagreed with the president with just 30 percent agreeing and six percent saying they did not know. The results showed significant splits on the question by age, race and party affiliation. Read the full poll results, with crosstab and methodology information, here.